The Frugal Burqueño: Awesome Win from Rio Grande Family Magazine! Awesome Win from Rio Grande Family Magazine! Are you familiar with Rio Grande Family Magazine? It's free and I pick it up at my local Smith's store. Each month you can enter their giveaway for a chance to win some neat prizes for your family. 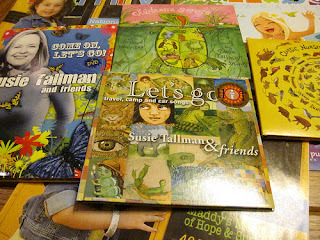 After I found this magazine I only entered once and I was very lucky to have won the Susie Tallman and Friends Fan Pack! This awesome pack includes the full- length dvd Come On, Let's Go! along with 3 cds: Children's Songs- Childhood Favorites; Classic Nursery Rhymes; Let's Go! Travel, Camp & Car Songs. It feels great to win something that everyone in a family can enjoy. I needed more music for the baby and now I've got it :) She already seems to have her favorite songs - Five Little Ducks, Let's go!, Peter Piper... I took a few pictures you can check out here. Find out where you can pick up your free copy! Enjoy your reading and winning!